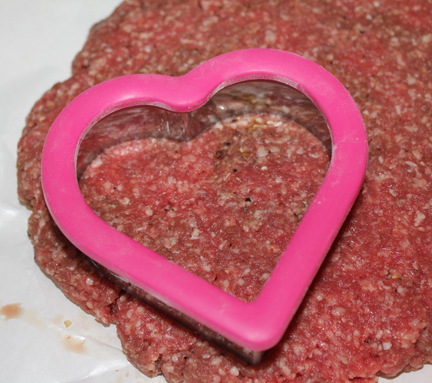 On a side note – if you don’t want to make burgers, you could also cut the meat into heart shapes for use with pasta (think meatballs, except in the shape of hearts). 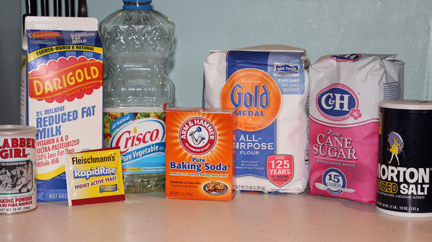 We’ll start with the dough for the buns then move on to the burgers. When they’ve puffed up a bit, bake them in a 350 degree oven until the tops are golden brown. 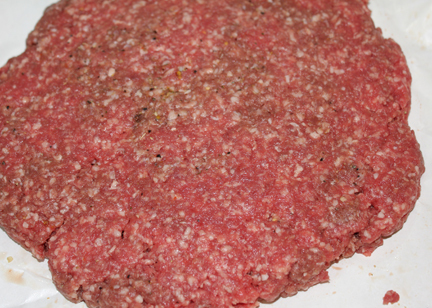 For the burgers, add whatever spices you like to the meat, then flatten it out to whatever thickness you like. I think ours were about 1/2 inch thick. 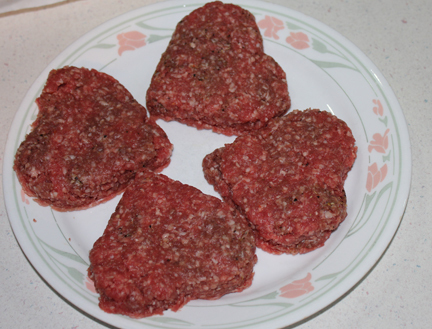 Using the same cookie cutter (so the meat and buns are somewhat uniform), but out heart shapes in the ground beef. How fun is that? Grill them or fry them or cook them however you like. (I may have begged until CC cooked our outside on the BBQ. Good thing the snow is gone and the temps warmed up yesterday!). 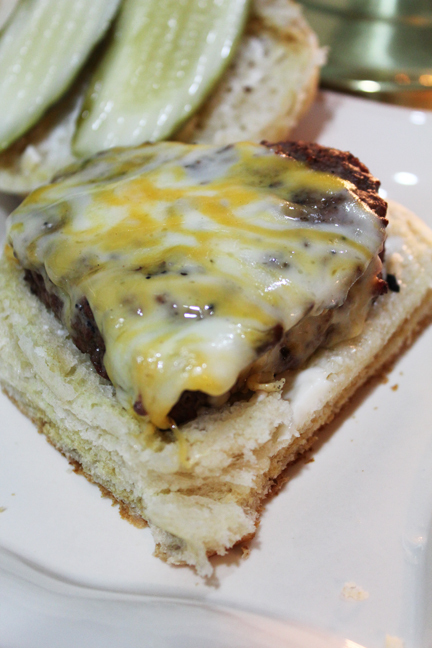 Once the meat is cooked, place it on your bun, add your favorite toppings and enjoy! 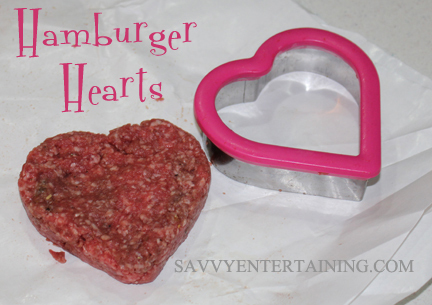 Roll out and cut into heart-shapes with a cookie cutter. I used one that was about four-inches wide. Place a single layer of hearts on a baking sheet, then place a second layer on top of the first (like you’re making a heart sandwich, except without the filling). Cover with a tea towel and return to a warm area to rise for another 20-30 minutes. When dough is ready, bake for about 10- 15 minutes, until the tops are a lovely golden brown. You should be able to easily separate the tops and bottoms of your heart-sharped buns, but if not, just got them in half. While the buns are baking, mix your ground beef with whatever spices you like. Pat it out to whatever thickness you like your burgers then use the same cookie cutter you cut out the buns with to cut out your burgers. 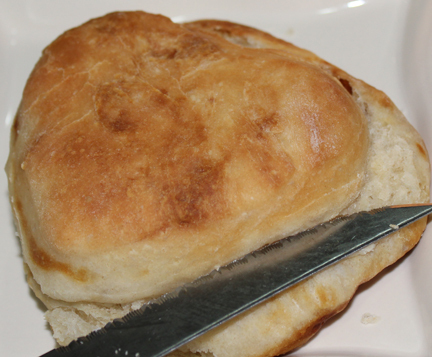 Cook (grill, fry, toss on the barbecue – whatever you like), then slide onto the bun. The bread will be just slightly bigger because it expands and the meat tends to shrink a little. Top with your favorite condiments and listen to your meat-eater praise your efforts. With the cookie-cutter I used, I had 24 hearts or 12 buns. The number you get will depend on the size of your cookie cutter. I used a 1 1/2 pound package of ground beef and got six burgers. You can cut the bread recipe in half if you want to make a smaller batch. Is this the correct link to get your recipes? It is Karen! I usually post recipes every Friday – except this week, which is special because of Valentine’s Day! You get bonus recipes!